Before planting okra, you'll need to make sure your soil is loose and airy to a depth of at least 8 inches. Choose a location that gets lots of direct sunlight - at least 6-8 hours a day. It's best to plant the seeds directly into the garden. Some people in very cool climates try to grow seedlings indoors, but they have a high failure rate after transplant. 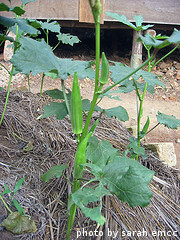 Okra plants do not do well if their root systems are disturbed. If you are forced to grow seedlings, use peat or other biodegradable pots that can be planted directly into the garden without having to remove the plant. We typically wait until soil temps are in the 70-75 degree F range before we plant our okra seeds. In our own garden, we fertilize the soil a few days before we plant our okra. We scatter a balanced granule fertilizer over the area and then water it in well. When the soil dries out a bit, we till one last time and then plant. We find that this fertilizer application really gives the plants the boost they need to get off to a great start. On planting day, begin by creating furrows 3 feet apart and 1 inch deep. Scatter the okra seeds in the row, averaging 2-3 seeds every 12 inches. Cover them with 1 inch of fine soil and tamp it down lightly. After planting the seeds, water them in well. 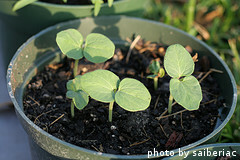 Seedlings will generally emerge in 2-3 weeks, depending on how warm it is. Once the seedlings are 2 inches tall, thin to one plant every 12 inches or so, keeping the healthiest looking seedling. 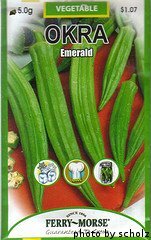 If you want to grow okra in a container, choose one that is at least 18 inches across and 12 inches deep. Make sure there are adequate holes in the bottom for drainage. Fill the container with good quality garden soil. Plant 2-3 seeds for every square foot of space in the container. Simply push the seeds about an inch into the soil and cover the holes with dirt. After planting the seeds, water them in well. Place the container in a very sunny spot. When the seedlings emerge, thin to 1 seedling every square foot, keeping the healthiest looking seedling. Now that you're done planting okra, it's time to learn about watering and fertilizing the plants.